Microsoft has published a list of certified Windows Vista-compatible hardware , along with the software list it published last week. Thousands of computer systems and hardware units are included on the list, which is growing longer by the day. Microsoft estimates that it will certify around 1,600 new units each month. To be able to use the 'Certified for Windows Vista' logo the hardware has to be tested rigorously to ensure quality levels, full compatibility, high security, as well as good performance and stability. Windows Vista-compatible hardware is split into two groups. The first, 'Certified for Windows Vista', includes hardware that is compatible with the premium functions included in some versions of Windows Vista , such as the Windows Aero user interface - not available in Home Basic - or the Network and Sharing Center. There is some confusion over this, but the criteria seems to be anything that's in higher versions of Vista, but not in lower-end versions. 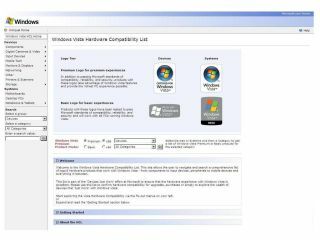 The second certification, 'Works with Windows Vista', indicates that the hardware has been tested to work with any version of Windows Vista - even the most basic. So before you rush out to buy any new hardware, make sure to check Microsoft's list to see if it's compatible with Windows Vista.